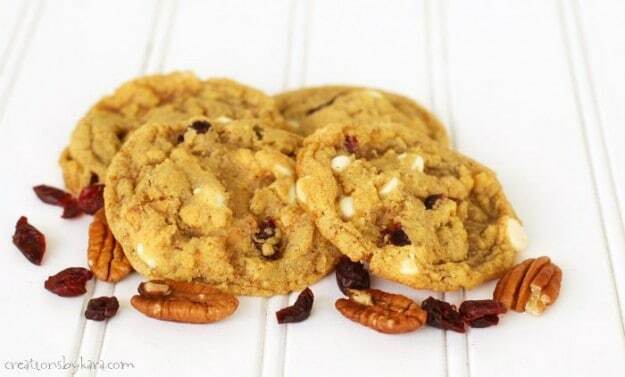 Chewy White Chocolate Pumpkin Cookies . . . If you like a chewy cookie rather than a cake like cookie, then this is the pumpkin cookie recipe for you! 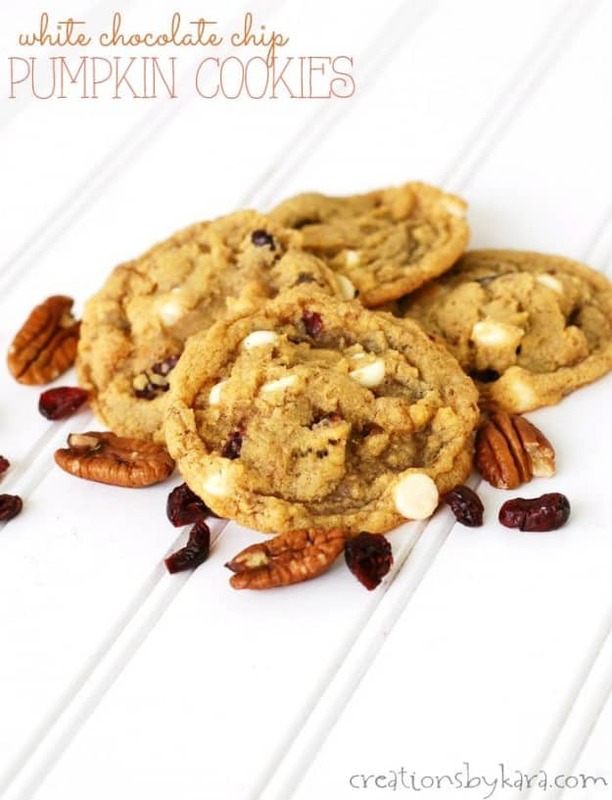 They are loaded with white chocolate, cranberries, and nuts, and they are delicious. 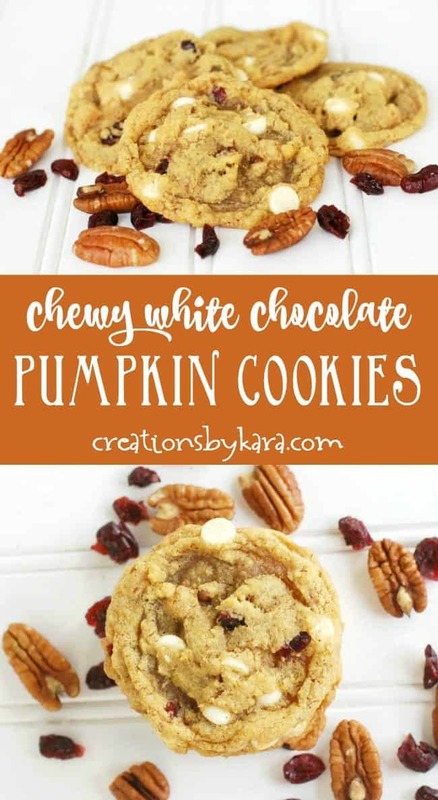 There are lots of recipes out there for chocolate chip pumpkin cookies that are soft and puffy. They are tasty, but I wanted something more like a traditional cookie. I found a recipe for pumpkin cookies at Sally’s Baking Addiction that didn’t have eggs. Sally said it made them more chewy and less cakey. So I tweaked it and came up with these. 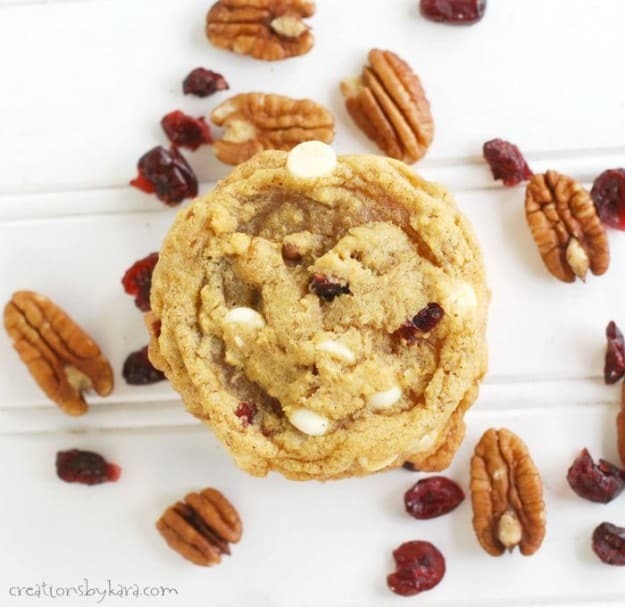 I love the sweetness of the white chocolate combined with the tang of the dried cranberries. It’s a perfect combination! These pumpkin cookies have just the right amount of spice, and an amazing texture. They are slightly crisp on the edges, but soft and chewy in the middle. I can’t wait to try different flavor combinations! Whisk together your dry ingredients and stir in. Fold in the white chocolate, Craisins, and nuts. You must chill the dough for at least 30 minutes or the cookies will spread too much. Drop chilled dough by spoonfuls onto silpat or parchment lined cookie sheets. Bake at 350° for 8-10 minutes. 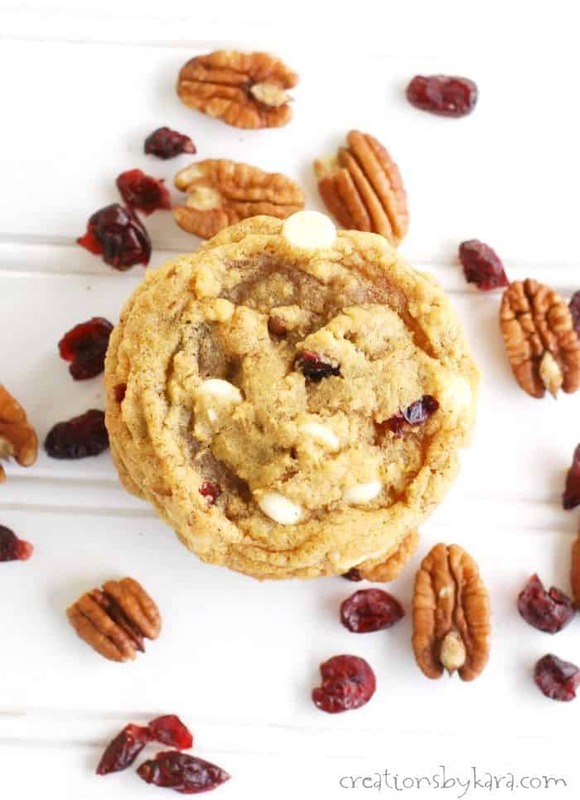 Chewy pumpkin cookies filled with white chocolate, craisins, and pecans. Cream butter and sugars in a large mixing bowl. Add pumpkin and vanilla and beat well. In a small mixing bowl, whisk together flour, soda, salt, and spices. Add to the creamed mixture and stir gently. Fold in the chips, Craisins, and nuts. Chill dough for at least 30 minutes, or overnight. Drop by spoonfuls onto silpat lined or lightly greased cookie sheets. Bake at 350° for about 10-12 minutes. 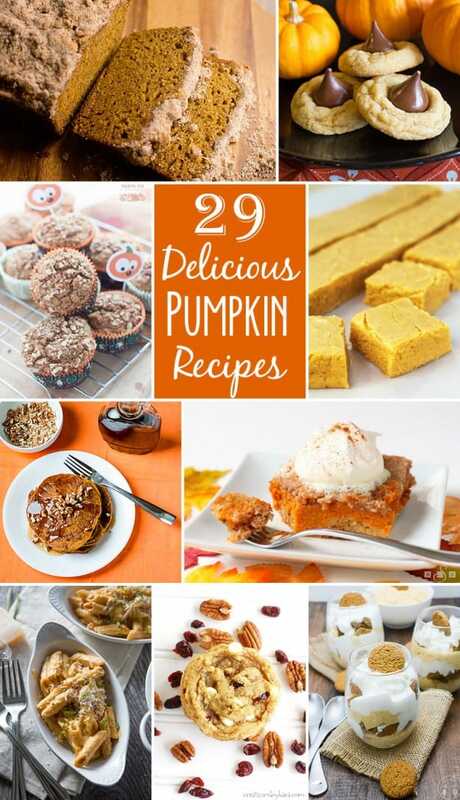 Today just happens to be National Pumpkin Day, so I have several more amazing pumpkin recipes from some of my blogging friends that you are sure to love! you say that we should use 1/3 can of pumpkin, but pumpkin cans come in two sizes, – small – about 15 oz, and big, about 32 oz – which should I use. The recipe is intriguiing. I use regular salted butter in all of my recipes.